(JTA) — The Trump administration is finishing up its Middle East peace plan and intends to make it public soon, The New York Times reported. The White House must now figure out how to present the plan so that it is not immediately rejected by the Palestinians, the newspaper reported, citing three unnamed senior administration officials. An unnamed senior aide to President Donald Trump compared the plan to Waze, the Israeli-developed traffic navigation software. According to the report, the officials said the plan does not have a set of guiding principles. Also, they said, the plan does not prescribe whether the outcome should be one state or two states, nor does it call a “fair and just solution” for Palestinian refugees, though it will offer suggestions on both points. The aides told The Times that the document proposes solutions to all the key disputes: borders, security, refugees and the status of Jerusalem. The Palestinians have said they will not consider a U.S.-proposed peace plan due to their anger over Trump’s announcement recognizing Jerusalem as the capital of Israel and his intent to move the U.S. Embassy there from Tel Aviv in May. Netanyahu is less likely to be willing to make compromises, as he faces early elections due to coalition disputes and fears fallout from possible corruption charges. The plan also comes as Trump has begun the process of dealing with North Korea. 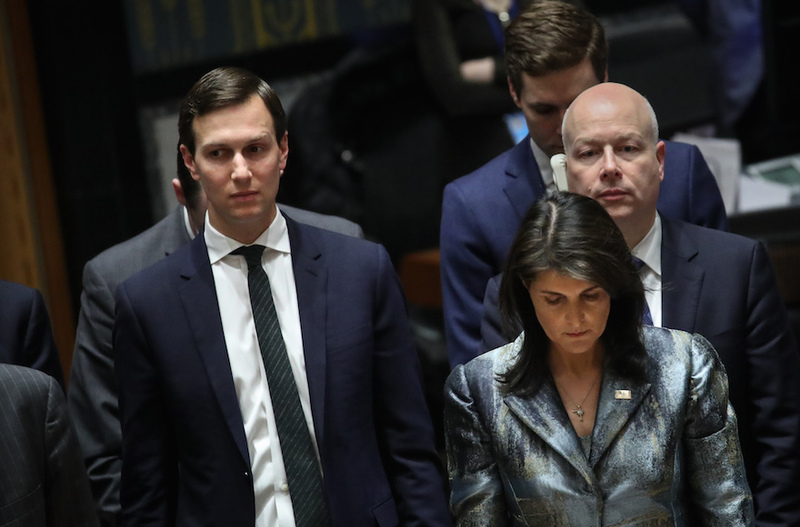 The report points out that no one outside of the Trump administration has seen the plan document, and that the people who wrote it — Jared Kushner, Jason Greenblatt and David Friedman – had no previous experience in diplomacy. But the three men reportedly met last week with Netanyahu for several hours while he was in Washington, D.C., to address the annual AIPAC policy conference and meet with Trump. The report comes a day before the White House convenes a meeting to address a crisis in Gaza. “Solving the situation in Gaza is vital for humanitarian reasons, important for the security of Egypt and Israel and is a necessary step toward reaching a comprehensive peace agreement between Israelis and Palestinians, including Palestinians in both Gaza and the West Bank,” Jason Greenblatt, the White House’s top Middle East negotiator said in a statement. The Palestinian Authority has refused to attend the session because it is still smarting from Trump’s recognition of Jerusalem as Israel’s capital. UNRWA, the U.N. relief agency charged with delivering aid to Palestinian refugees and their descendants, and which is the preeminent relief provider in Gaza, was not invited. Gaza is controlled by Hamas, a terrorist group. U.S. officials participating include Kushner, Greenblatt and staff from the National Security Council and the State Department. A White House official said the names of non-U.S. participants would be published on Tuesday.